Finally some time for a new blog entry! I am busy 24/7 since my puppy Ruby moved in with us end of November, but more about her later. Ruby deserves an own entry and she improves my daily life in so many ways. 2013, the new year…I am not a NYE person anyway and this year was no exception. Well, I am certainly glad 2012 is over but also scared as a new year means another “good” year is gone. And statistically there are not that many years left before I could reach the next stage of MS.
NYE with a deteriorating illness is no fun because you know it will most likely just get worse each year. 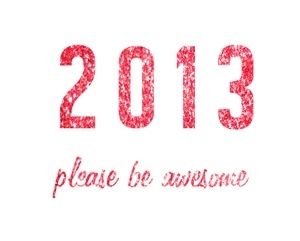 Wishing you all a fab& awesome 2013! Too much thinking is bad for your health. Believe the good things doctors (and friends!) tell you, don’t believe the bad things, very important! MS feeds itself on pessimistic attitude. The more pessimisic you are, the worse MS will get! !